Expert Quality, 245mm ratchet forged from high-quality chrome vanadium steel that's been hardened, tempered and satin chrome plated for corrosion protection. 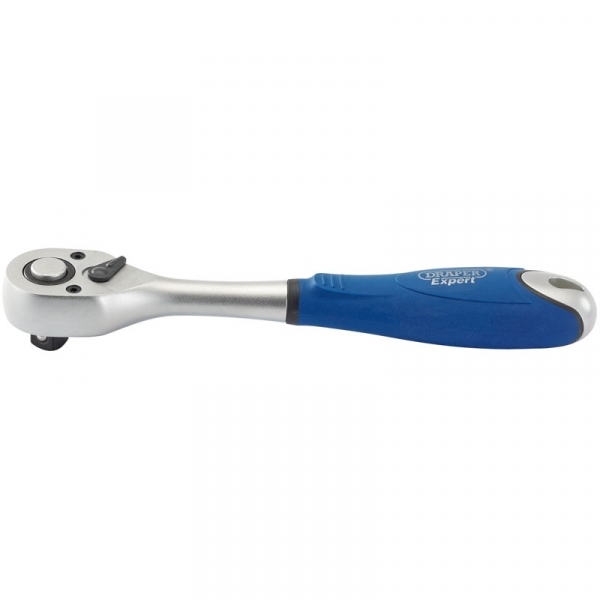 Fitted with 48 fine yet robust teeth ratchet mechanism which ensures a smoother ratcheting action and featuring a reversible switch for easy one-handed direction change. Attached to a comfortable soft grip handle and a "quick release" mechanism that ensures quick socket release whilst always maintaining a secure socket grip. A durable yet strong ratchet, due in the main to the superior construction which exceeds the DIN3122 and ISO3315 specifications. These qualities help deliver a ratchet perfect for workshop, garage and engineering use, that easily breaks rusted and seized fasteners faster and easier.